Doing gigs since 1998, The Binyomin Ginzberg Trio is a New York area band with a stripped-down sound. The music would be run-of-the-mill Hassidic pop, but thanks to its sophisticated and worldly methods, standards are mixed in with less-known gems and presented in an honest, jazzy manner. In addition to Ginzberg’s own understated vocals and jazzy keyboards, Aaron Alexander plays an extremely snare-centric, nicely-accented drum kit. The third member of the “trio” is usually Michael Heitzler on clarinet, but many other guests also make appearances. 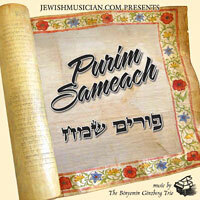 The group’s newest recording, Purim Sameach, is a veritable world tour, exploring the Purim holiday’s various musical themes through the prism of a mind-bogglingly eclectic mix of inspirations. Washington, DC’s well-known DJ duo Thievery Corporation is famous for making albums that lead listeners around the globe with moods, samples, instrumentations and rhythms from Brazil interspersed with those from India, France and elsewhere. Here, Ginzberg’s arrangements draw from a comparably varied well, with each track focusing on a theme such as “Mordechai Medley” or “Mishenichnas Medley” and putting it all together into an ambitious yet cohesive composition. The repertoire on this album includes the songs of a variety of Hassidic sects (including Lubavitch, Bostoner, Rav Areleh, Skulener); a Mordechai Ben Dovid parody; covers of songs by Reva L’Sheva, Chaim David and the Diaspora Yeshiva Band; a Nurit Hirsch tune; a tribute to seventies American act Ruach; Hungarian folk melodies; some klezmer standards, and even an old-time African-American spiritual. The opener, “Mishenichnas Medley,” kicks off the journey in a manner that teeters on familiar religious-pop, but by the time it closes with a punchy “hava narisha rash rash rash” teaser, we know there’s a lot more to this record. © 2005 The Jerusalem Post. All rights reserved.